This temperature switch project will provide you with an understanding of the use of germanium diode and how it works compared to the more common silicon diode. It works on the principle that as the temperature surrounding the germanium diode increases, the back resistance decreases sharply. The schematic of the project is as shown below. It uses only 10 components to illustrate the understanding of germanium diode and its characteristics. 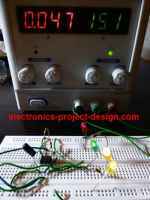 This project is suitable for beginners to electronics and will definitely help to inculcate the interest in designing electronic projects. You can use any equivalent NPN and PNP transistors to replace BC548 and 2SC2002 respectively as these parts may not be freely available in your country. After you have connected all the devices and powered up the circuit, a digital thermometer is required to calibrate the triggering temperature by adjusting the variable resistor VR1. Place the tip of the thermometer close to the germanium diode before when you are calibrating the threshold triggering temperature.